Reading about the gig economy, I can’t help but think of regulatory and structural change. (Chart data are AMECO rebased to 2000, own calculation). Economic theory predicts that, given an elasticity of substitution of labour for capital below unit (hence that capital and labour are complementary), a negative shock to investment (such as a financial collapse) implies more unemployment or lower wages as labour becomes less productive. Since 2009, labour has caught up with the secular trend of higher capital intensity to improve the ratio of labour to capital in the economy. 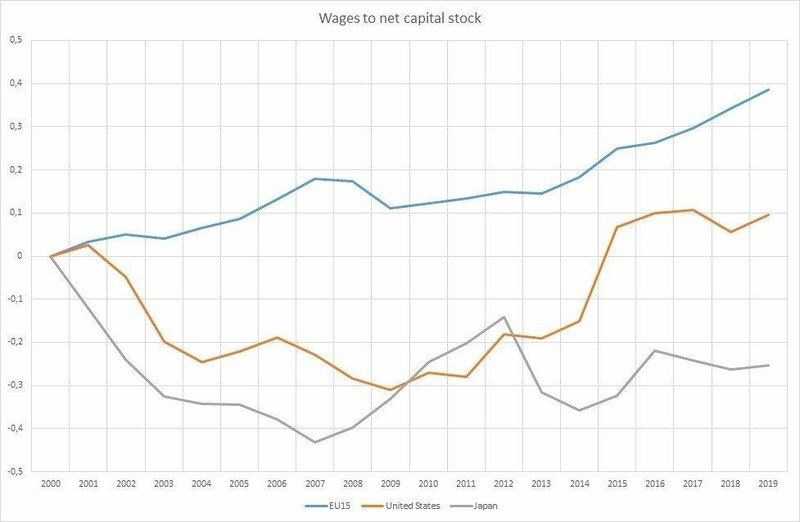 In Japan, the trend inverted in 2002 such that firms increase the labour content of output faster than net capital stock. The trend was sufficient to invert firms’ preference for capital investment and lower the trend pace of the unemployment rate in the largest OECD economies below that of net capital stock. The trend predates 2009 as returns on capital dipped below the investment pace between 2005 (US) and 2007 (EU) and has since failed to recover above the level observed in 2000. 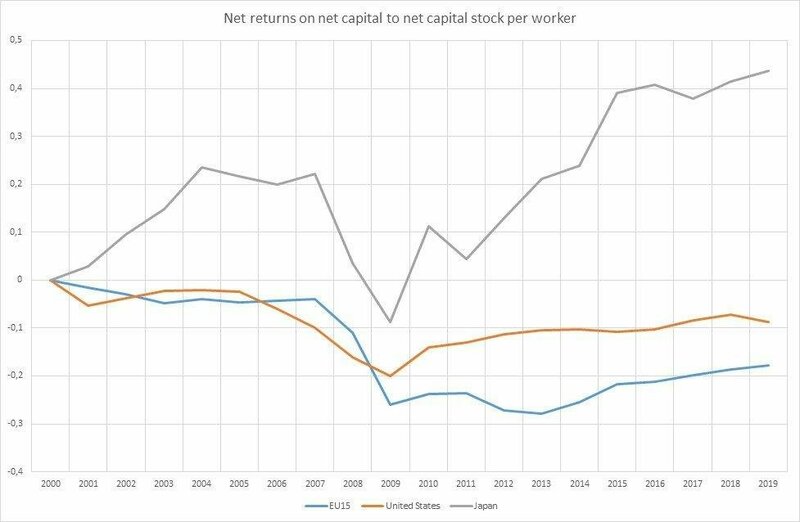 Understandably, firms prefer labour to capital investment except in Japan where returns to capital increased vis-a-vis capital intensity per worker in 17 of the 18 years plotted. 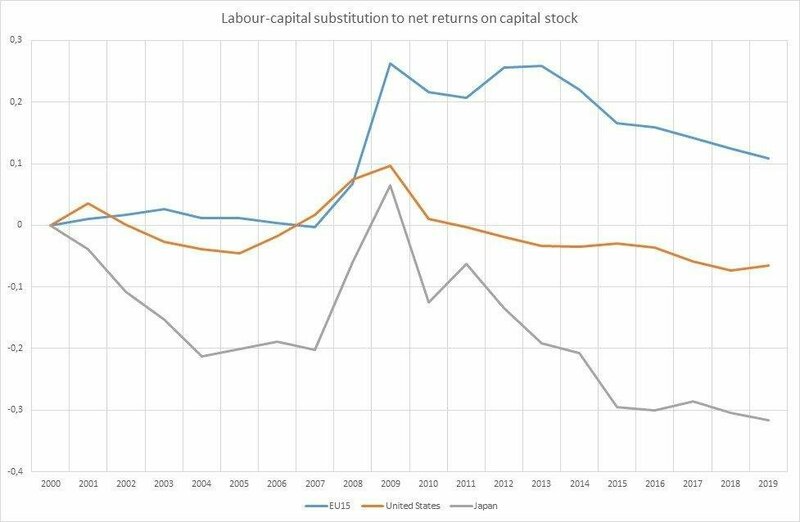 and pushes returns on labour above returns on capital. Considering the 2010 IMF’s estimate of the elasticity of labour to capital substitution (.99) for the US and the EU, I apply that value to the index of elasticity for the same year computed by AMECO. Trusting these figures, the elasticity is now above (.04%) unit such that labour and capital are substitutes. The unit value also impacts prices such that higher returns on labour imply lower returns on capital, as seen in the previous chart. 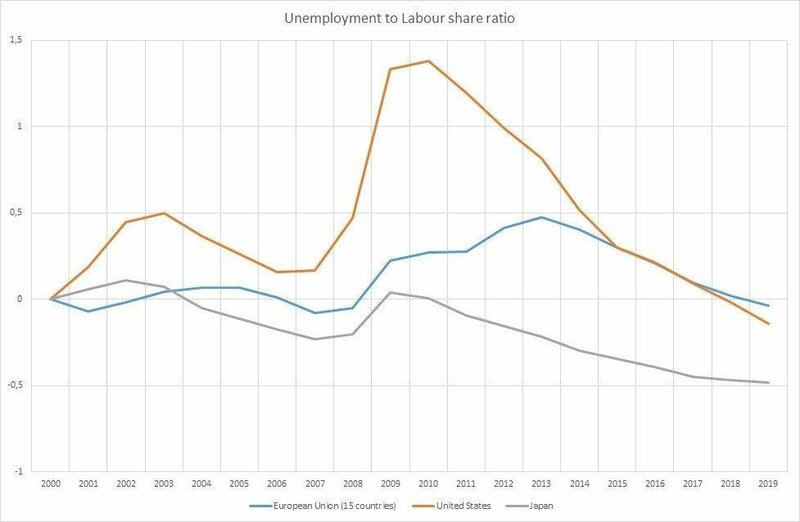 Furthermore, economic theory predicts that the labour share shall increase when the elasticity is above unit if the capital to labour ratio increases, a phenomenon observable on the top chart’s upward slope since 2009. Considering the increase in firms’ cost of capital after 2008, the labour income share would decrease if labour and capital were complementary. 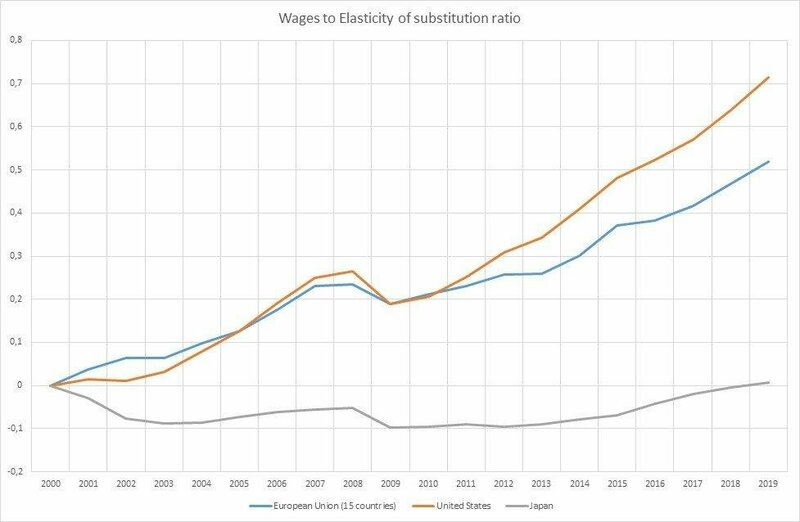 The following chart seems to confirm the intuition that until 2010 in the US and Japan, and at least until next year in the EU, labour and capital remain(ed) substitutes. Acemoglu assumes labour and capital complementarity and labour-augmenting technology to conclude that an exogenous shock to capital cost (a supply shock) would reduce employment, increase wages and lower the interest rate. The shock would also reduce capital intensity and thus increase the labour share until the interest rate is restored. This is quite visible in the following chart. The dip in labour share between 2007 and 2009 is consistent with supply shock – it was only when interest rates decreased in 2009 (and most significantly in Europe from 2013) that the labour share and wages began increasing. The ECB finds that half the contraction in GDP after 2008 is due to a loan supply shock. The chart also hints at lower policy interest rates as cause of subdued demand for capital, an observation I’d previously made based on firm theory of prices. The effects on unemployment are visible in the following chart. As predicted by Acemoglu, unemployment was above the pre-recession level until 2017 while wages to capital increased, firms preferring higher remuneration of labour to investing in capital (considering the loan supply shock). The 2008 recession had financial causes such that firms and households defaulted on loans conceded in the (unfulfilled) expectation of higher productivity. 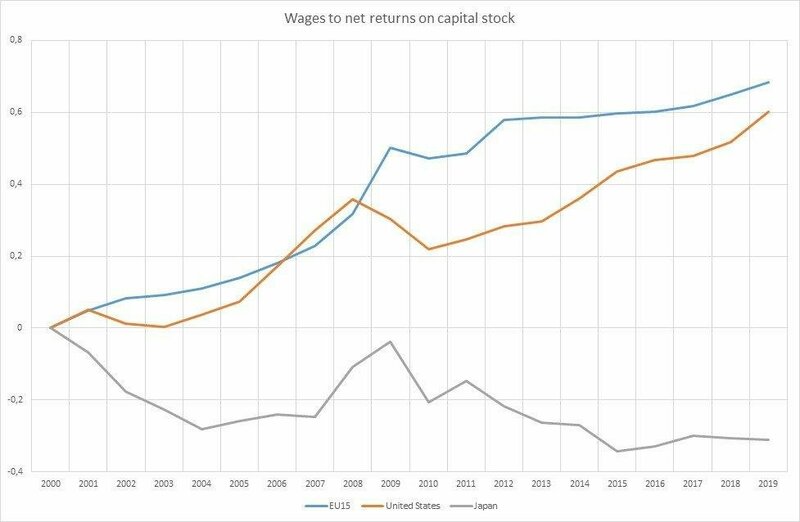 As visible below (and also on the chart comparing net returns to capital with capital per worker) lower returns to capital increased the growth pace of earnings from between 2005 (US) and 2007 (EU). Thus, while interest rates remain low, firms shall refrain from resuming capital accumulation. The decision is compounded by the substitutability of labour and capital observed in recent years such that the labour share increases and encourages investment in labour-augmenting technology. 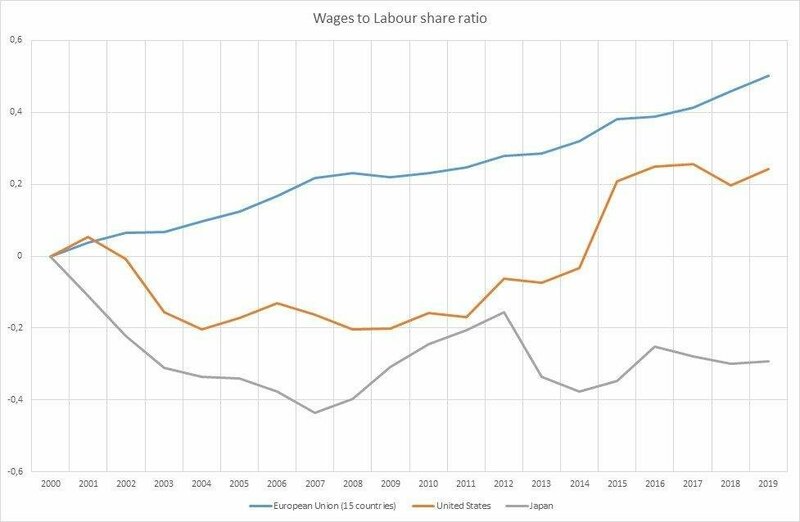 The trend is long-standing, more in Europe than in the US as in Europe wages increase much faster than the labour share, a consequence of lower returns on capital visible on the second chart. The trend is further reinforced by low unemployment despite an increasing labour share and increasing wages. Firms are thus prone to continue investing in labour-augmenting technology that increases labour use while improving wages due to labour scarcity. The degree of substitutability compounds the trend, leading firms to explore new ways to save on increasing labour costs – including the gig economy. Economic theory further suggests capital should accumulate faster when substitutability is significantly above unit. 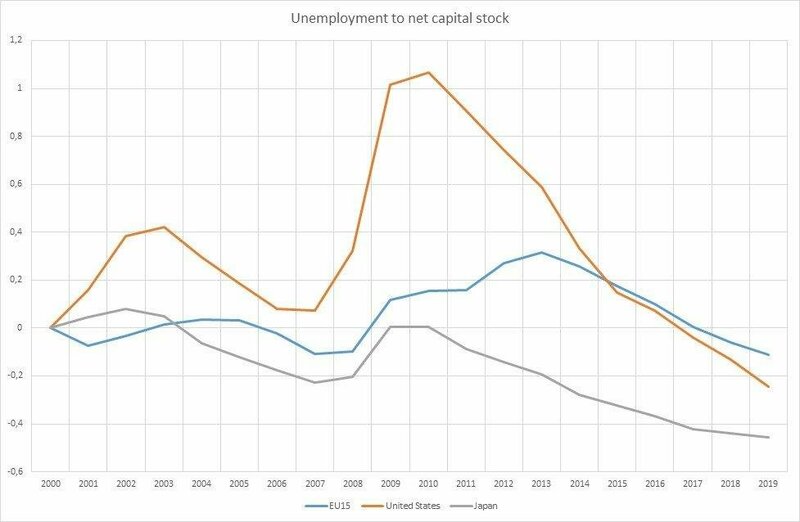 The recent (2017) dip in the unemployment to capital ratio below the 2000 level seems to hint at such an increase while lower returns to capital may withhold faster capital accumulation. The gig economy relies on labour-augmenting technologies instead of capital-augmenting technologies : extending work schedules instead of buying new vehicles (Uber) or opening more restaurants (Deliveroo), renting rooms at the expense of privacy and comfort instead of building more hotels (Airbnb), even hiring specific skills on a needs-basis instead of permanently (TaskRabbit). Alternatively, firms could improve capital to increase its complementarity with labour (new mobility solutions, self cooking machines, space-saving interior design and so on) yet that is likely to happen in the current juncture only if capital obsolescence increases (eg a shock that nudges capital replacement such as 5G networks or a policy-induced higher fiscal deductibility of investment as I previously argued or policy mandated pollution limits). Acemoglu foresees that when labour-capital elasticity is above unit (thus, when these are substitutes) the system does not return to stability. It leads to capital accumulation as visible on the top and second charts and to capital innovation conditional to the capital rate of return. Going forward, the value of innovation is expected to increase as interest rates increase. Current policy interest rates below the growth rate make for a negative value of innovation of either capital or labour varieties, with the value of capital innovation further depressed by the (perceived) substitutability of capital and labour. As wages increase, so shall the price of labour-intensive goods relative to capital-intensive goods. At this juncture, lower interest rates lower the cost of capital goods, dampening investment in capital-augmenting technologies. Thus, in conclusion, the gig economy is much the result of capital-labour substitutability, a (loan) supply side shock to the economy and lower interest rates. Growth in capital intensive goods, and hence capital-augmenting innovation is due to remain subdued as long as the combination of higher wages and increasing labour-intensive goods does not put pressure on prices (as it seems to be doing) and thus as long as it withholds higher interest rate (this is visible in the top chart’s upward slope of the EU curve). This is a labour intensive recovery. * Thus there is both a demand and a supply effect of the recession – yet policy had focused mostly on demand side effects.